THE BREEDING season’s in full swing at Macca Lodge and among the mares to produce a foal so far is the wonderful matron Winter Rose, dam of Group 1 winning Panspacificflight filly Arden’s Choice. After a string of fillies, the In The Pocket mare has produced her second Somebeachsomewhere colt. Breeder John Stiven of Arden’s Lodge has been a big fan of the son of Mach Three right from the start and bred one of his very first horses here, Someardensomewhere (seven wins, $70,000 in stakes), who sadly collapsed and died in training earlier in the month. Someardensomewhere was the first horse syndicated by the Stivens and this year they’ve syndicated two Somebeachsomewhere yearling colts — one out of Winter Rose and the other out of her Group 1-placed daughter Southwind Arden. While Somebeachsomewhere’s fully booked this season, Macca Lodge is still taking bookings for his son Net Ten EOM. John’s also a big fan of Panspacificflight and convinced his late mother Noreen to book seven mares to him in just the second season he was available here. Arden’s Choice was one of the foals. This season John’s awaiting the birth at Macca Lodge of three Panspacificflight foals — out of Tosca Hanover (dam of Hunter Cup winner and New Zealand Cup contender Arden Rooney), Rockahula Arden (Rocknroll Hanover-Ardenart) and Ruby Morn (a Presidential Ball half-sister to Machtu). THE MACCA Slaccas they call themselves, but they’ve been walking around the stables with a spring in their step after syndicate horse Deceitndesire rolled home at Forbury Park on Sunday. The Macca employees leased the Bettor’s Delight mare only three weeks ago and she was having just her second start for them at Forbury. Dexter Dunn hunted her to the front from her outside draw in the 2700-metre standing start before taking a trail behind the favourite and sprinting up the passing lane for a comfortable win. While Tony’s the official trainer, there are five unofficial ones — the other syndicate members, Tony’s partner Dawn Wilson, Caine McIntyre, Serenity O’Connor, Alison Jackson and Mark Gutsell — who are no doubt all claiming a bit of credit for the win. The TAB must have taken a bit of a hammering on fixed odds. Deceitnsdesire opened at $35. We’re not sure what the bookies closed her up to at the finish, but there was quite a bit of punter interest and, in her first show of form, she ended up paying just $11 on the tote. So who got the money? “I got a wee bit (at $18), but it certainly wasn’t me,” Tony says. Deceitndesire is the third winner for the syndicate after they enjoyed success last year with One Christian and Euromaxx. THE RED ROBBER became Panspacificflight’s first qualifier from his third crop — now two-year-olds — when he contested the Gore trials on 14 October. Owned by the McIntyres, he’s a full brother to the speedy Sir Mac’s Man (who raced as Mac’s Man here), the winner of four in Australia with a best mile time of 1:57.5. The Red Robber has been put aside to develop. Another to qualify was the three-year-old Panspacificflight filly Concorde Dawn, who became her sire’s 10th qualifier from 32 foals in his second crop. Panspacificflight had an impressive 19 qualifiers from his first crop of 23 foals, now four-year-olds, and he needs just one more of them to win to boast a 50 per cent winners-to-foals record. WATCH OUT for the new Macca Lodge colours this season. All going well, they’ll be seen in the race the stud is sponsoring during Cup week in Christchurch. They’re navy blue with emerald green sleeves with the Macca Lodge logo on the front and back. Replacing the blue with green stars, they were first worn by junior driver Craig Ferguson behind Bonnie’s Khaleesi at Gore this month. She finished fourth first-up for the season and will race next at the Riverton meeting on 01 November. With a bit of luck Bonnie’s Khaleesi, last season’s Southland Three-Year-Old Filly-Of-The-Year, will then contest the $20,000 Macca Lodge-sponsored South of the Waitaki race on Show Day at Addington. It’s a 2600-metre mobile for C1 and C2 pacers. Eligible horses must have been registered with a southern trainer as at 01 August. FOOTNOTE; Horses trained at Macca Lodge who are not owned by the McIntyres will continue to race in trainer Tony Stratford’s own colours. PANSPACIFICFLIGHT has made a flying start to the 2015-2016 season, boosted by the emergence of Arden’s Concord, who extends a remarkable family connection between his sire and Artsplace. Arden’s Concord (centre) outstays Robyn’s Bad Boy and Popular to post his third win at Invercargill on 20 September. 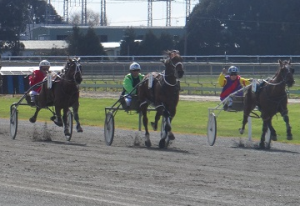 The four-year-old gelding notched his third win from just six starts when he scored again at Invercargill on 20 September. Unlike his two previous wins, when he blasted out of the one-one to outsprint his rivals, this time Arden’s Concord won from the front, covering the 2200 metres mobile in 2:46.6 with the last half in 58.5 and the final quarter in 27.9. 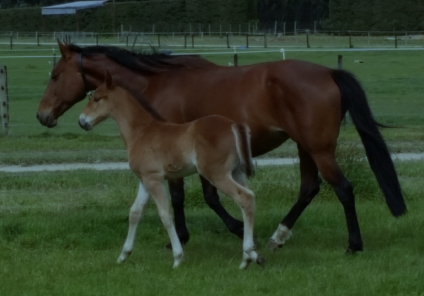 He’s the last foal out of the Artiscape mare Madam Maroussia, who has left other good performers in Sachin Arden, Ideal Arden and Arden Castle. The Stivens of Arden Lodge were quick to cross a mare descending from Artsplace to Panspacificflight. The logic here is overwhelming. Panspacificflight is a half-brother-in-blood to the Artsplace sires Art Major and Perfect Art. He’s a half-brother-in-blood to Worldly Beauty, by Artsplace, one of North America’s best racemares. We don’t think that’s an exaggeration for a horse that was the Two and Three Year Old Filly Of The Year, went 1:49.3 and earned nearly $US2 million in stakes. And he’s also a half-brother in blood to Worldly Treasure, who left a reasonable sort to Somebeachsomewhere in Captaintreacherous (1:47.1, $US3 million). Oops, nearly forgot to say that Worldly Treasure’s also by Artsplace. For good measure, his dam is a half-sister to top sire Real Artist, by Artsplace. And, to complete the picture, Panspacificflight has a pretty useful half-brother by Artsplace called Theredandpanlines, who has won 50-odd races and nearly $US1 million in stakes in North America. Of course, the Stivens have hit the jackpot with Panspacificflight’s outstanding two-year-old filly from last season Arden’s Choice but among the mares they booked into Pans in his second season here was the young Artsplace mare Ardensplace. She produced First Class Arden, who qualified for Grant Payne in 1:58.5 as a two-year-old and was good enough to make the Sires Stakes Final at Addington in 2015. Sadly he dropped dead on the training track when he was being prepared for his three-year-old campaign by Barry Purdon at Clevedon. Finally, Panspacificflight’s biggest winner, Fridaynightflight (1:51.6, 21 wins, $US602,000) is out of a mare sired by Grinfromeartoear, a son of Artsplace. IMPRESSIVE two-year-old qualifier Mucho Macho Man could be heading for the Young Guns series in Auckland at the end of the year. The son of Mach Three and the unraced Bettor’s Delight mare Alisa is another horse in the Macca Lodge stable owned by Kenny Baynes. She’s out of the Ferndale Star breed of his late father Colin. Ferndale Star was one of the Hokonui Stud’s cornerstone mares and Colin named some of her progeny after his son back in the 1960s and 70s — Kenny Charles, Young Kenny and later on Sir Kenny, who all went on to race in the United States. She also left the good winners Moonshiner and Sly Brewer as well as fillies in Hokonui Star, Gentle Miss and Taxi Dancer. Taxi Dancer was the dam of NZ Free-For-All winner Tax Credit back in 1988 but the family hasn’t been prominent in the past couple of decades. Mucho Macho Man, who is from the Taxi Dancer line, could be about to change all that. FOOTNOTE: Kenneth Charles Baynes was himself named after a horse — Young Charles, the sire his father stood at stud, who left none other than the mighty Young Quinn. THREE-YEAR-OLD filly Envious will make a poignant return to racing at the the Gore Harness Racing Club meeting on 10 October. She’s owned by Jo Calder and her partner Kenny Baynes, a son of former owner-trainer, breeder and administrator Colin Baynes, who died in Gore this week. He was 94. The club has renamed Envious’s race the Farewell Colin Baynes Mobile Pace. Champion reinsman Dexter Dunn will drive the Changeover filly, wearing the Baynes colours known to the harness racing community through the deeds of horses like Cool Cat, Clancy, Game Paul, Roman Gladiator and, most recently, Cool Cobber. Envious is trained at Macca Lodge by Tony Stratford. LITTLE RASCAL, arguably the best performed of Panspacificflight’s first New Zealand crop, resumes in a $20,000 race on premier night at Addington on 09 October. The Robert Dunn-trained four-year-old gelding has drawn No 1 on the front line in his first standing start. That mightn’t be ideal but he has been beginning well at the trials. He zipped over his last 400 metres in 26.2 when he won at the Ashburton trials on 29 September. Little Rascal has done most of his racing from Dunn’s northern base, winning all four of his races at Alexandra Park, where has recorded impressive winning mile rates of 1:56.9 over 2200 metres and 1:59.6 over 2700 metres. But he stayed in the South Island after running in the Jewels at Ashburton. He’s owned by Ian Dobson of Christian Cullen fame. .
Another talented Panspacificflight pacer down to race this weekend, Arden’s Concord, has been scratched from his Gore engagement. Trainer Matt Saunders says he’s not 100 per cent and doesn’t want to risk him. FOOTNOTE: Little Rascal lived up to his name in contributing to the shambles at the start of this race. He finished up being put to the unruly position but blew the long-delayed start anyway. Back to a mobile the following week, Little Rascal rattled home for fourth from a bad draw over 1950 metres and will be worth following during Cup week.